The Atari Mega STe is the successor of the Atari Mega STf. It is an Atari STe with some features of the TT (the case, the VME bus) and has a new version of TOS (2.05 and 2.06). It has (like the Mega STf) a battery-backed up clock. The user can choose in the configuration panel the speed of the CPU (8 or 16 MHz) and can switch on or off a small memory cache. Thanks to these two features, the Mega STe was really faster than the STf. Some companies developed VME graphic cards for the Mega STe. 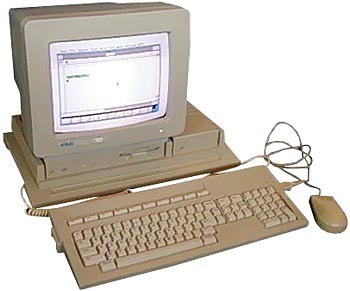 This computer had less success than the Mega STf and was used as a publishing station or in music studios. A minor note: the Mega and TT gave a nod to the earlier integrated-keyboard ST series by adding a tongue-and-groove design element for loosely connecting the keyboard to the base of the CPU. The Mega STe ended production in 1993. This was also one of the few Atari product to have an Appletalk networking port (or RS432)built-in. The TT030 was the first machine to have it and the Falcon also had one. Some models included hard drives, and some did not. The drives were usually shipped separately to the the dealers, and installed in the store. The internal hard-drives in the Atari Mega STE where SCSI, not IDE. A small internal SCSI adaptor board had to be installed for this feature. The Mega STE was the fastest released official ST from Atari and included the VME bus from the TT030. The bottom of the range Mega STE 1MB machine had an optional SCSI drive, though all other machines in the range came with SCSI as standard (At least here in the UK). The maximum official RAM capacity was the same as the rest of the ST range at 4MB, though there were upgrades available from 3rd parties that took advantage of the 68000 address bus, allowing for up to 16MB to be added. The Mega STE makes an excellent MIDI sequencer, and the LAN port can make use of early Apple Macintosh MIDI interfaces, so long as you are using Cubase and the latest version of MROS. The Mega STE is also the only one of Atari's 'Professional' range of computers to have a TV modulator on the back, allowing it to be used if a monitor is not available. The 'open' version had 2 MB of RAM but no hard disk. see more Atari MEGA STe Ebay auctions !